This Instruction Article explains how to print a previously approved, older version of a label stored in LABEL ARCHIVE via SENTINEL instead of the current version. When a label is stored in LABEL ARCHIVE, the name of the file is the one given to it by the user during the Check-In process. LABEL ARCHIVE will automatically assign a version number. By default, SENTINEL will only print the latest approved version of the label. If the user wishes to print an earlier version, then the user will need to direct SENTINEL select that version. BATCH NO. /DOCUMENT NO. :="1810240002"
PRODUCT NAME/MATERIAL NAME :="Test Product"
In the above example, the latest approved version of the label FORM_77248_SL is version 3. By default, SENTINEL will print version 3 of the label. To instruct SENTINEL to print version 2 of this label, the version number will need to be added to the file name. For the example above, the filename would then be: FORM_77248_SL_02. In File capture mode, the text file usually contains the name of the label file to be printed. If you are using a method other than File capture, the concept remains the same. Grant Archiving Admin privileges in the CODESOFT Printing Plugin . 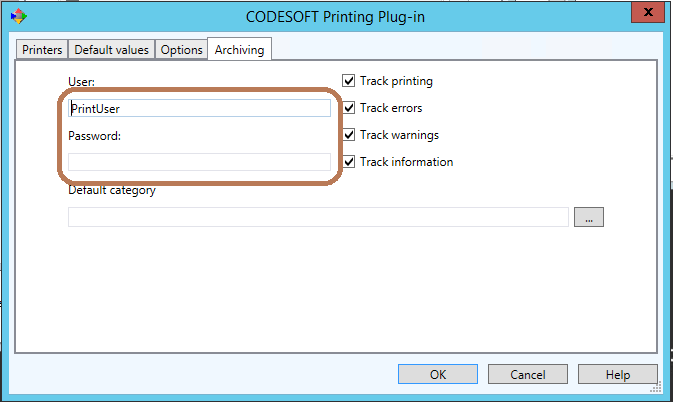 Note: The default user in CODESOFT is PrintUser. It does not have permission to access older version of the label file. Changing the user to Administrator gives it the needed privileges to access the older file.